Threatening and violent social media posts and overt actions against Trump administration officials and their families have escalated sharply in recent days. Apparently, some are taking the lack of outrage as permission for expanding the scope of their efforts. Thus, it's not enough to threaten the President's 12 year-old son Barron, as Peter Fonda did. This week, a Canadian TV writer threatened his four-year-old granddaughter. What's next? Cousins and in-laws? This incident has received some press coverage — in the UK, but virtually none in the U.S. establishment press. A search done at the same time at Google News on "Trump Chloe" (not in quotes) for the past week returned 10 relevant items. None were establishment press outlets. The only U.S.-based newspaper in the results was the Washington Times. A supplemental search esrly Sunday evening still didn't find any U.S. based establishment press items. Despite Dussault being a Canadian, the only online notice of his threat found at a Canadian establishment press outlet was an oped at the Toronto Sun, whose author warned that "Trump hatred has become a drug, an addictive and dangerous drug." Early Sunday evening searches on multiple terms at the Associated Press main APNews.com website returned no relevant results. The same was true after searches on multiple terms at the New York Times. 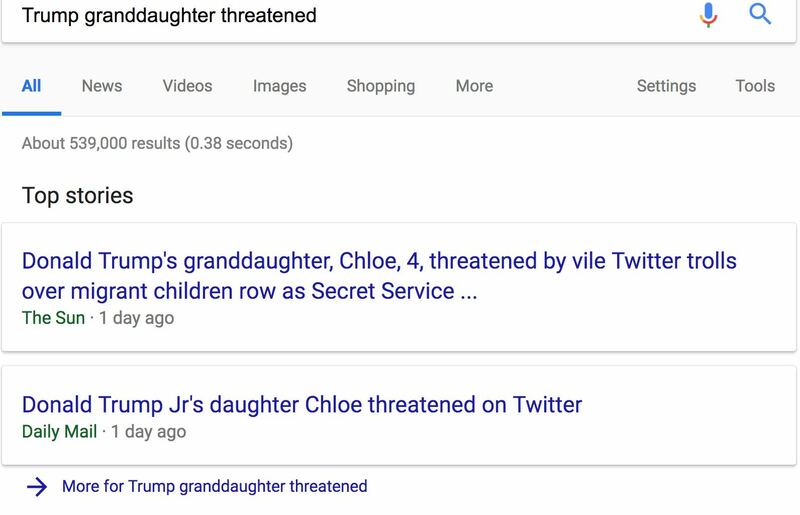 Searches at the Washington Post (not in quotes) on "Trump granddaughter" and "Chloe Trump" returned no relevant results. Washington Times reporter Eric Schiffer and CRTV's Deneen Borelli appeared on Fox Business's Evening Edit show on Friday to discuss the left-driven threat escalation with host Liz McDonald. LIZ McDONALD: Deneen, this month, it is the one-year anniversary of the shooting at the Republican baseball practice that left congressman Steve Scalise severely wounded. A lot of heated rhetoric agitated the shooter. Now this. And Deneen, the Secret Service is reportedly notified of a TV writer's post. So how seriously should we take this kind of rhetoric? DENEEN BORELLI: I think it should be taken very seriously, Liz. This vile, vicious and vulgar comments that are launched against President Trump, his family, and actually anyone that's associated with him, all of these comments should be taken seriously. How do we know that the people who are making these comments, this guy in Canada, Peter Fonda, how do we know that someone won't actually act on these comments? I tell you, it's really reckless and it's dangerous what they are doing, and I do believe they should be investigated at the very least. McDONALD: Eric, to Deneen's point, actor James Woods brought attention to the threat against the President's granddaughter saying, quote, "This is exactly the kind of violence that has been inspired by Peter Fonda's tweet. The individual making the suggestive terrorist threat against the granddaughter of the President is a, in quotes, 'TV writer,' which sadly makes sense in today's twisted world of Hollywood." What do you think, Eric? Does he have a point? SCHIFFER: Look, I'm not sure that it's directed at the Hollywood -- you know, the movies, per se. But what we do have are some pretty whacked-out people. This kind of behavior is out of bounds, and on behalf of trying to protect children, they're putting children's lives at risk and certainly threatening kids and sending a message to others that it's okay. This kind of stuff should be condemned. It's pathetic. But what's really sad is Fonda, for instance, will probably get more work in Hollywood because of it. It will actually probably help his career. If the children or grandchildren of leftist politicians were subjected to this treatment, the establishment press would be covering the incidents wall-to-wall, and its reporters would be demanding that every available Republican or conservative denounce the threats. Currently, they are engaging in no visible attempt to get Democrats or other leftist leaders to directly respond to the threats made against either 12-year-old Barron Trump or four-year-old Chloe Trump. Censorship Crime Culture/Society Double Standards Conservatives & Republicans Liberals & Democrats Twitter Fox Business Network Regional Media UK Deneen Borelli Donald Trump Donald Trump Jr.